How To Stay Focused & Motivated With Your Online Business — Dynamo Ultima | Branding, websites, workshops & beyond. When you are running your own business while traveling and living on the road, it can be difficult to stay focused… especially because you’re enjoying all that freedom. Sometimes, it feels like you have almost too much freedom! 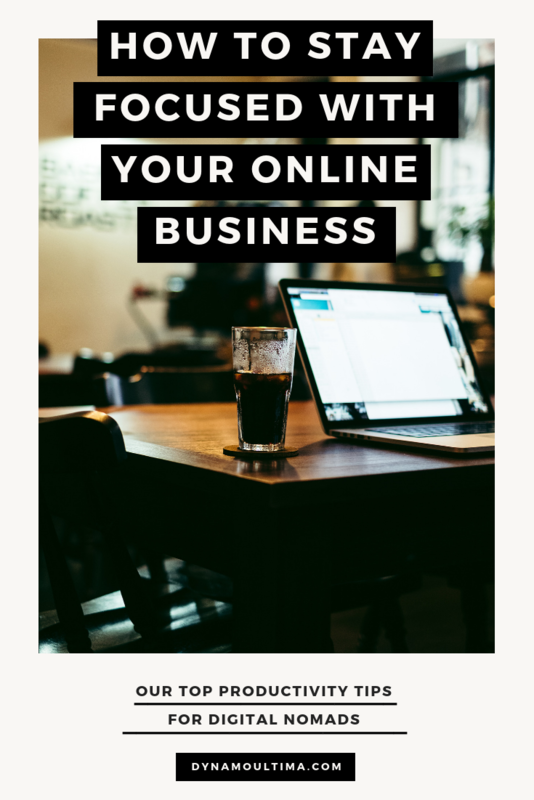 We want you to have a thriving, successful, online business so that you can truly enjoy the lifestyle and that means staying productive even when it’s difficult to do so. 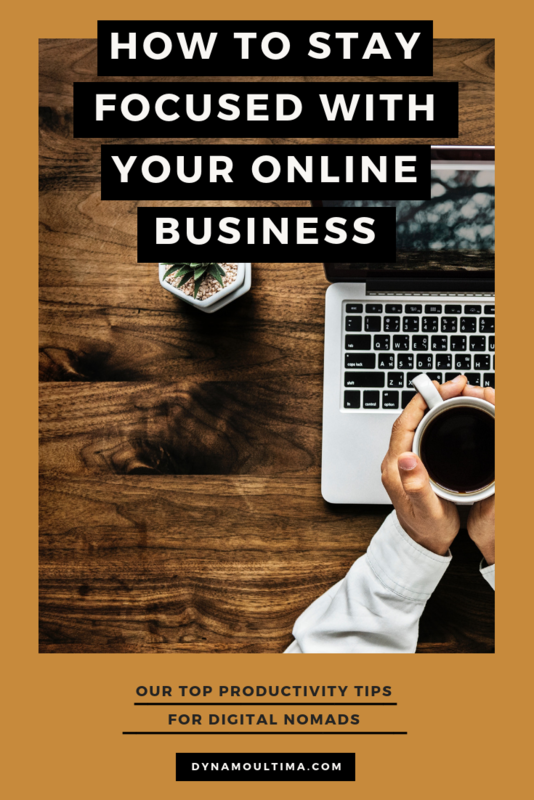 These are our best tips for staying focused and keeping the momentum in your online business so you don’t fall behind. This is one of the best ways to stay focused. If you haven’t already, turn off all your phone notifications for your social media sites! It’s a huge distraction, and it doesn’t serve any purpose other than keeping you from doing the work. It’s not really that important to know when someone likes or comments on your photos and videos. Save the scrolling for later in the evening when you’ve finished all of your work tasks for the day. For those of you who can’t resist, you can also use apps on your phone like Moment to help you block out certain apps during specific times of the day. I like to do this with bigger projects. If I finish one of my projects by a certain date, I like to tell myself I get to go out to a fancy dinner or buy a bottle of champagne. You can even use small rewards! For example, if you finish writing that blog post you’ve been meaning to write, take yourself to the coffee shop and grab a delicious cappuccino! Rewarding yourself is a good incentive to help stay focused and finish the task at hand. Multitasking has been the one thing that holds me back from making any progress. When I work on too many different projects at once, it’s hard to focus. By telling yourself to focus on ONE task, you’ll reach your goals a little quicker. I also think it’s important to use a project management app like Trello or Asana. These are great for breaking up your projects into smaller digestible tasks each day. Doing this will help you stay focused and get more done, one small step at a time. As annoying as it is, I’ve noticed that when I take care of myself (the biggest asset of your business), good things start to happen with more ease and flow. If you take care of yourself, you’ll feel more confident. 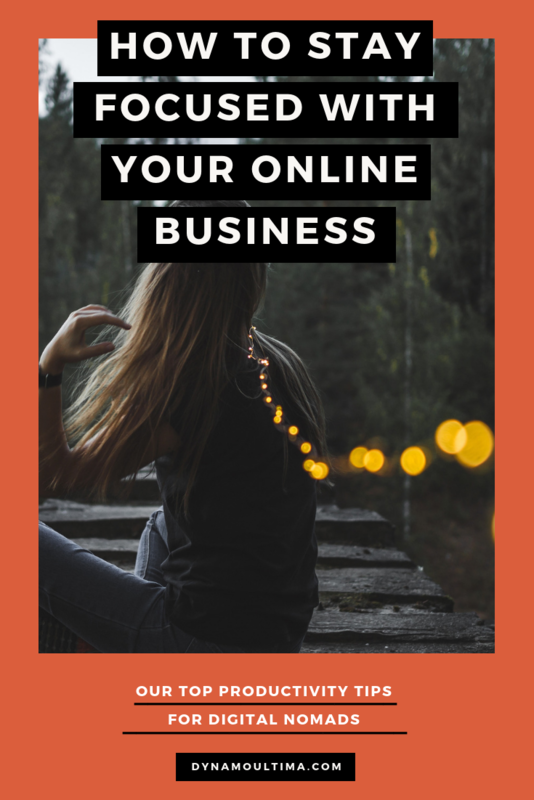 Confidence is KEY to selling anything on the internet, so if you feel confident about yourself, you’ll probably have an easier time finding clients, jobs, and selling your products. So eat well and try to incorporate consistent physical activity into your day. Even walking for 30 minutes daily can drastically improve your health. If you’re just not feelin’ it, take a break. Work on something else for a little while. Read a book, watch inspiring YouTube videos, or go on a hike. You’ll be able to come back to the task with a renewed and refreshed mind. Some of my BEST ideas come when I’ve walked away from the screen! If you work from the road, you’ll likely be working alone. Working alone can definitely have its drawbacks, the main one being lack of community and socialization. Unlike a regular job where you see your co-workers every day, you’ll have to make an effort to meet up with people, socialize, and get out of the “office.” I’ve found that making an effort to socialize drastically improves my productivity and makes me feel great. You can do this by planning coffee dates with friends, working in a coworking space, Skyping with other business owners you meet online, or chatting with people in support groups. If you’re in need of a support group, you can join our free community for digital nomads by clicking here! I know that the idea of freelancing, working from home, and having more freedom sounds nice because you can work in your PJs, but what I’ve learned from doing this too often is that it really brings down my self confidence. Getting ready for the day when you wake up in the morning pretty much tells the world that you’re open and ready for any opportunity that comes your way. What if you get a phone call from your dream remote job to set up a Skype interview and you’re wearing PJs and have bed head? If you sit around in sweatpants all the time, you’ll just feel lazy. Putting on a nice outfit and taking the extra time to make sure you look your best is one of the easiest ways to stay focused and motivated every day.